Narayan Mahat is originally from Arghakhanchi District but now resides at Gorusinghey, Kapilvastu. He served the Indian army for more than 20 years until his retirement last year. He now drives a e-rickshaw for a living. His rickshaw is a sustainable and affordable form of transportation benefitting local people of Gorusinghey for short distance travelling. He also sits as a Secretary in Hindu Hymn Association of Gorusinghey, Kapilvastu. If my family members, including myself, are able to exercise our rights fully, I’m at a state of peace. Narayan believes that peace should start within the family as it is the most basic unit of society. He adds that if a family is happy and at state of peace then neighbours, and ultimately all members of society, get encouraged to live the same. Nepal, however, is fraught with issues related to family well-being. Nepal’s legal stipulations on the rights of women and children, for example, look excellent on paper but it is often disregarded mainly due to absence of consistent implementation and oversight mechanisms. Civil society organisations are working with the government on how to protect women and children from oppression and exploitation. 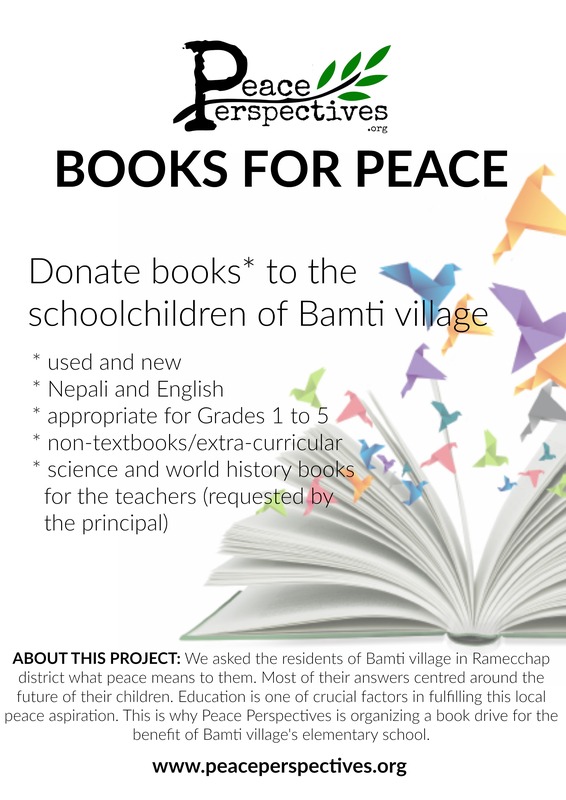 Peace Perspectives joins in this initiative by echoing the peace aspirations of all Nepalese, including women, children, and other marginalised groups. Learn more about our work and consider donating to our community outreach activities. Jamuna Adhikari runs a local Bar at Budhhabhumi, Kapilvastu. Her two sons are currently studying at a nearby boarding school. As a student myself, her genuine response to what peace meant for her left me speechless. When the atmosphere is favorable for my children to get good grades, that is peace for me. That is what gives me peace. Jamuna has a reason to worry about his children’s performance in school. For example, in 2015, the average marks for core subjects tested for School Leaving Certification (SLC)* in Nepal were barely passing. Nepal’s educational system faces several issues: poor infrastructures, lack of physical access to schools, insufficient teaching materials, low quality of teaching, outdated curricula, compounded by poverty and social exclusion. Confronted by these challenges, the Nepalese government is taking positive strides toward improvement of the educational system. In his recent budget presentation to the Parliament, Finance Minister Bishnu Prasad Poudel enumerated several plans for education covered by the 2017 budget. If these plans get implemented, mothers like Jamuna will have at least one less thing to worry about. Peace Perspectives believes that peace education reduces conflict and alleviates socio-economic injustices. Learn more about our work and consider donating to our community outreach activities to help us contribute in addressing some of the educational issues in Nepal. * SLC is a nationally-administered and monitored qualifying examination for secondary/high school students. While winnowing her grains at mid-day sun, we met 53-year-old Dumkala Adhikari. Her husband works all day on the field because it is the only source of income for their family of six. After marriage she came to Basantapur, Kapilvastu in the southern part of Nepal where she now resides. She originally hails from Arghakhanchi District, Western Nepal. Peace means being free of diseases and not to suffer from any illnesses. My heart is at peace. If you are not sick, it is good for family as well. Dumkala has not been able to work due to her illness. She added that it has become very difficult for her husband to work alone on the fields. Expensive medical charges make her reluctant to regularly visit a doctor. She is currently under limited medication and her husband bears all her medical expenses. Dumkala hopes to get rid of all her diseases so that she could resume in contributing to household expenses, which ultimately leads to happiness among family members. For Dumkala, peace means a healthy life. According to World Health Organization’s 2015 data, Nepal’s life expectancy is at 69.2 years, ranking 118th out of 183 countries. At a glance, this is a fairly good indicator considering that the average life expectancy worldwide is 71 years. However, based on the recently developed Health Adjusted Life Expectancy (HALE), which measures years lived healthily and without disability, Nepal’s life expectancy lowers down to 61.1 years and ranking 121st out of 183 countries in 2015. Furthermore, if 33-health related Sustainable Development Goals (SDGs) indicators are factored in, Nepal gives a starker picture ranking only 158th out of 188 countries in 2015. Learn more about our work or consider donating to our research and outreach activities to help us work with people like Dumkala in living a healthy and peaceful life in Nepal. Behind a row of cows, Damar carries a stick and a “kukri” or Nepalese knife. We encountered him and his herd while traversing the steep hills of Simma, a remote village in the eastern region of Nepal. “What can I do? All my sons are “laure” (overseas workers) and I’m the only one left in my family to do the herding.” This was his response when Suman asked him why he’s still herding that late afternoon. Damar is 84 years old. If I am well, that is peace. If I don’t have to worry about food and shelter, for example. Damar’s definition of peace is as simple as his life. He talked more about his sons. There was a glimmer of pride but also hint of loneliness in his eyes. Damar is a manifestation of an emigration phenomenon affecting every corner and sector of Nepal and every aspect of its people’s well-being. BBC reported in 2015 that “more than three-and-a-half million Nepalis – that’s well over 10% of the population of this mountainous, underdeveloped country – have left to work abroad over the past 20 years.” When a 7.8-magnitude earthquake shook the country in April 2015, the consequences of this massive outflow of people became more apparent. There was no one left to rebuild. And the devastation of this natural disaster forced more Nepalese to leave the country. While more young men and women leave the country for greener pastures, people like Damar are left behind to continue living in the pastures of Nepal. Learn more about our work or consider donating to our research and outreach activities to help us work with people like Damar in sustaining a simple and peaceful life in Nepal. Govinda Gurung owns the lodge we stayed in. It was like a homestay: we ate what they ate and slept where they slept. Throughout our stay, the lodge was always packed with travellers who walked for hours across the hills and needed warm food and shelter for the night. Every night, strangers huddled around the fire, talking to while their time, and becoming closer like a family when the last ember died. Every day, Govinda bids goodbye to the family he fed and sheltered the previous night. It’s a daily cycle-a cycle that he is now used to. In any case, he has a family that never leaves: a wife, four sons, three daughters, and a granddaughter. The seemingly endless greetings and farewells are comforted by the fact that he has a family that stays with him every night, by the fire, and every morning, before the first ray of the sun bathes the hills he calls home. Before we left Simma, we asked Govinda what peace means to him. His answer, like his way of life, was communal. Peace means happiness and facilities in village or country. How about you? 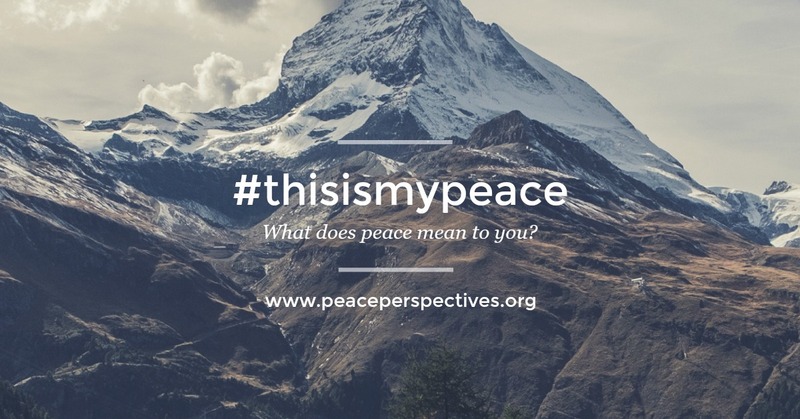 What is your peace perspective? Is it personal or is it communal like Govinda’s? Share your definition here or consider donating to Peace Perspectives to help us fulfil Govinda’s definition of peace.